The Olde English Bulldogge is a loyal, courageous dog, with a very stable temperament. They are medium height with large size, large strong head, and stout muscular body. Olde English Bulldogges are athletic and most importantly of very good health, males are free breeders and females are free whelpers. The Olde English Bulldogge is devoid of all breathing issues and is capable of enjoying outdoor activity with their family…a wonderful companion, protector, and family member. They are very trainable, thrive on pleasing their owners, and do well inside or out. Life span averages 10 to 14 yrs. The Olde English Bulldogge is said to have originated in England between the 16th and 17th century. These were the early ancestors to many of the Bull breeds that exist today including the English Bulldog and the American Bulldog. The Olde English Bulldogge was originally bred to take part in sports such as bull baiting. In England the so-called sport of bull baiting was popular throughout the beginning of the 18th century. The olde English bulldogge had to be a courageous and agile dog in order to be able to perform what was expected of him. In the 1830’s there were laws passed in England prohibiting the blood sport of bull baiting, which in turn terminated the purpose of the Olde English Bulldogge. As a result of the prohibition, the population of the breed declined almost to the point of extinction within a decade. It was at that time fanciers of the breed decided to recreate the breed, focusing on diminishing the aggressive temperament of the original Olde English Bulldogge. They crossed the remnants of the existing stock with other breeds over the years that followed, and developed the modern English Bulldog. Unfortunately though, this modern recreated breed is plauged with many genetic health problems. 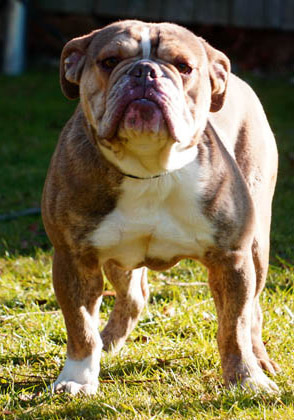 The Olde English Bulldogge of today is a reconstruction of the original 17th and 18th century bulldogge. 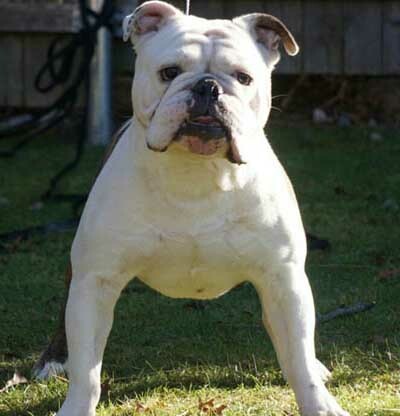 To obtain this goal, carefully and thoughtfully planned breeding programs have used various dog breeds, including English Bulldog, American Bulldog, APBT and Mastiff, selectively in various combinations to obtain the desired physical traits of the original Olde English Bulldogge. 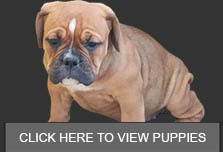 The result is an attractive, healthy and athletic bulldogge. Dogs that are free breathers, breeders, and whelpers, possessing a sound stable temperament. Today’s Olde English Bulldogge is recognized and registered with the International Olde English Bulldogge Association (IOEBA). 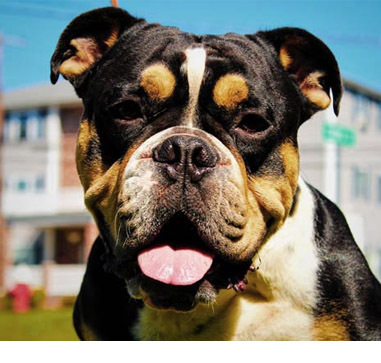 The IOEBA’s detailed Olde English Bulldogge Breed Standard is the best guide as to what the perfect Olde English Bulldogge should look like and act like according to the International Olde English Bulldogge Association, the largest and most recognized registry for the breed. The ideal Olde English Bulldogge is a loyal, courageous dog of medium size with a large powerful head and stout muscular body. Olde English Bulldogges are athletic and most importantly of very good health, males are free breeders and females are free whelpers. The Olde English Bulldogge is devoid of all breathing issues and is capable of enjoying outdoor activity without concern except in extreme heat or cold. The temperament is very stable and trustworthy making them a loyal companion, capable protector and the ultimate family member. Olde English Bulldogges thrive on pleasing their owners and are very trainable. Their lifespan is between 10 and 14 years. Head : Large and high, moderately sunken between the eyes (medial furrow). The circumference of the head should be equal to or greater than the dog’s height at the shoulder. A narrow head or one that appears too small for the body is a fault. Ears : Rose ears set well on the sides of the head are preferred. Dropped ears are acceptable as long they are small, not “hound like”. Full pricked ears that stand up on top of the head should be considered a serious fault. Muzzle : Broad, deep and short with moderate wrinkling. The bite is undershot with the bottom jaw turning up noticeably. Lower canines should not protrude. Muzzle too long (more than 3 inches), scissor bite or even bite are disqualifying faults. Muzzle should be no shorter than 1 ½”. Wry jaw is a disqualifying fault. Eyes : Wide apart and of moderate size. Any color is acceptable. However, odd eyes (one dark, one blue or light) should be considered non preferred. Misshapen or bugged eyes are a serious fault. Lacking pigment around the eyes is undesirable. Crossed eyes or non-symmetrically shaped eyes are a disqualifying fault. Nose : Broad with open nostrils (nares) with no sign of air restriction. The nose should not be pushed up between the eyes. From the stop to the end of the nose must be at least one and one half inches. The nose should be a solid color. Lacking pigment is a serious fault. A nose lacking all pigment is a disqualifying fault. Neck : Short to medium in length and very muscular flowing into the shoulders and should not be set on the dog so it appears to stop at the shoulders. Chest : Ribs should be well sprung (rounded) and the chest wide and deep. Depth of chest should be at least to the elbows. A hollow or narrow chest (slab sided) should be considered a serious fault. Back : Males should appear square and balanced. Females should appear similar with consideration given for body length. Short with a very slight rise from the shoulders to a slight drop in the croup is preferred. A level back is acceptable as long as the tail does not come straight off the top of the back. Shoulders : Shoulders should be well laid back with significant angulations to allow for good movement. Straight shoulders are a fault. Legs : Forelegs should be straight and wide apart, neither bowing out nor turning in. There should be significant bone substance. Elbows should be relatively close to the body. Lacking bone and substance is very undesirable. Elbows that are loose or “fiddle fronts” are a disqualifying fault. “East / West” forelegs are a serious fault. Rear legs should exhibit significant bend of stifle so to allow for good movement. They should be well muscled. Straight or “posty” rear legs are a serious fault. Cow hocks are a disqualifying fault. Movement : Dogs should have a balanced gait that drives off the rear and is complimented by reach allowing the dog to cover ground with a sense of power. Dogs should single track. Pacing or crabbing is a serious fault. Feet : Round, tight both front and rear, and the pasterns should be strong. Weak pasterns and/or splayed feet are disqualifying faults. Height : Males – 18 to 20 inches at the shoulder. Females – 17 to 19 inches at the shoulder. long as the dog is well proportioned, otherwise correct and balanced. Color : Any color, except merle, is acceptable with no preference for one over another. The coat is short. A wavy coat or a long coat is a disqualifying fault. There should be no signs of feathering on the legs or neck area, also a disqualifying fault. or a docked tails are acceptable. The pump handle tail should be carried low and not over the back of the dog. Temperament : Disposition should be outgoing and happy. While a watchful nature may be expected at home, human aggression without provocation is a disqualifying fault.